Conversion on your website depends on two things: providing all necessary information to the user and not providing irrelevant information. 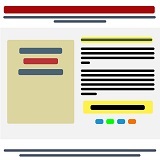 Your website should have as much information as necessary but nothing more. Start from your landing page. You want to experiment on new users that don’t know much about you. Remove all information that is irrelevant and check the conversion. Fictions are elements that distract users from doing what you want them to do. Remember these three fundamental things: communicate why your product is relevant, show value, and provide a clear call to action. Most landing pages fail to have all three must-haves.